Using only the latest technology in dental supplies production. Dentta Company offers its customers top of the line and cutting edge products for the modern dentist. All our products span the North Americas. We deliver promptly to any U.S. State and in Canada. 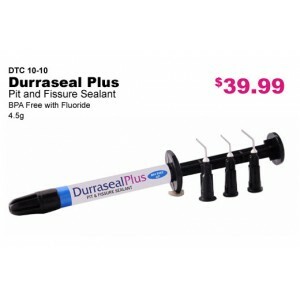 Durraseal Plus BPA Free Pit and Fissure Sealant is a light-cured, radiopaque, Fluoride releasing composite sealant. It is stronger and more wear resistant because it is filled with resin and has less polymerization shrinkage than competing products. The composite resin formulation is designed for effective sealing of pits and fissures on primary or permanent posterior teeth to help protect against cavities. The Bis-GMA based formulation has a low viscosity for easy placement and is designed to flow easily into the smallest pit and fissures. The flow-able sealants have excelllent penetration into tight adaptation with high bond strength to the enamel for high wear resistant. To apply promotion, please add the free item to the cart. 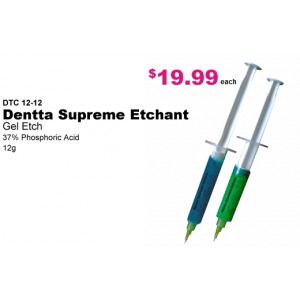 include porcelain, dentin and enamel gels that are available in easy to use dispensing syringes. 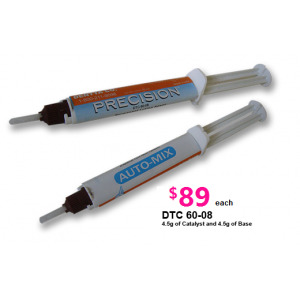 This is a unique self-etched filled composite, multi-purpose permanent cement with greater dependability resin technology that generate a high tensile and compressive strength. Upon application, PRECISION Luting Agent has low film thickness to assure complete seating of fixed restoration in one fast and easy step by eliminating the bonding, etching and priming procedures. This contains fluoride release to prevent the possibility of tooth decay. Radiopaque for easy identifications in radiographs. The strongest and safest cement that does not cause any sensitivity. Our Leading Hybrid Composite now comes in Flowable! of BIS-GMA and Triethylene Glycol Dimethacrylate. Item is 4.5g each sold individually in shade of A2, A3, A3.5 and B2. of BIS-GMA and Triethylene Glycol Dimethacrylate. The filler has particle size ranging from 1.5 microns which releases flouride.. Contains 2% Sodium Flouride (by weight). 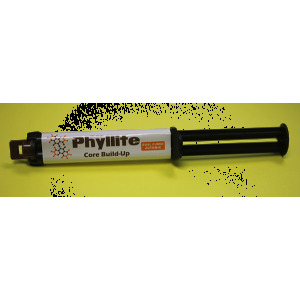 A composite based core material designed for the easy fabrication of core build-up and may also be used to cement post when used in conjunction with suitable dentin adhesive. The core material is a dual cure, fluoride releasing resin core material. Dispensed with an automix in mixing a cannulas providing a consistent homogeneous mix. Intra oral application are provided for precise, direct placement of core material. Light Cure Nano-Orthodontic Adhesive material is highly filled 80% by weight. With the smallest particle size of 7 nano-meters compared with most conventional Nano-composite on the market. Offering the most desirable characteristics, in versatility, easy of handling, aesthetic & reliability. 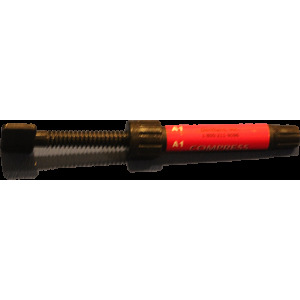 The material is designed for direct bonding of ceramics, plastic & metal brackets. Due to the fact that this is a light cure material, there is a relief from the time pressure which contributes to easy of working with the material. The dentist therefore, has plenty of time for cleaning the excess of adhesive around the bracket bases obtaining reproducible bond strength & bracket placement. 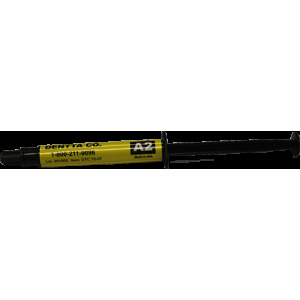 A single component light –cured adhesive, E-Z Bond R-All-In-One provides the highest adhesion to all surfaces for both direct and indirect application when used with PRECISION resin cement. 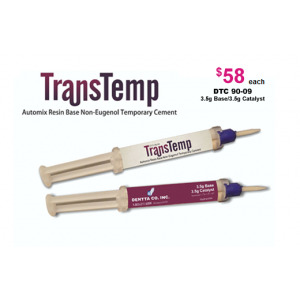 TRANSTEMP Automix Resin Base Non-Eugenol Temporary Cement permits the placement and retention under the function of permanet crowns, bridges, splints and their temporary counterparts. The cement is insoluble fluids and retains a tight marginal seal to prevent seepage of these of these fluids under the restoration. The cement will withstand functional stresses and permit ease of removal. In addition it has sufficient flow to facilitate complete seating of the restoration. The product is intended for use less than 30 days. Compress Light Activated Microhybrid Composite is a direct dental restorative material made by Denttaco and designed meet ADA Specification for Resin-based Filling Materials and ISO standard requirements. The product was designed to be used as a direct placement filling material for teeth to restore both function and aesthetics. Its sole purpose is to be played into and onto hard tooth structure and not to contact any internal soft tissues. Item is 4.5g each sold individually in shade of A1, A2, A3 and A3.5.